There once was a time in the early twentieth-century when the sport of polo was a hallmark of St. Norbert College sports program and its popularity called for a gas station to serve the needs of sports fans near the old polo field, just north of the De Pere City limits, just off of what is today Riverside Drive. The modest structure consisted of a stylish Japanese roofline and its broad overhang. Sinclair Oil Company provided gas to motorists and the St. Norbert Polo team provided the entertainment draw. Eventually a small sandwich restaurant and even a row of small cabins was added to accommodate guests. But time marched on and brought change. In 1937 St. Norbert College replaced the polo field with Minahan Stadium, attempting to popularize the new port of football for St. Norbert College. 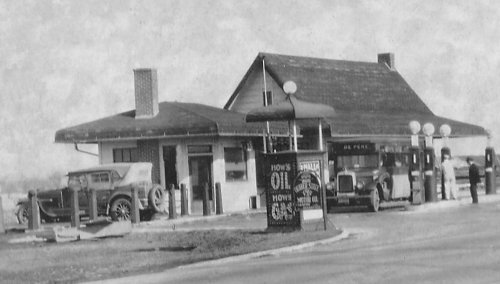 Eventually the gas station that came to be called Polo Resto closed for good and was largely forgotten as another old structure on the edge of town. By 2004 development of the area called for the old structure to be razed. Cooperative efforts between local businesses and the De Pere Historical Society led to a campaign to raise the funds to save Polo Resto. Within a month, $10,000 had been raised and Stephen Stiles of Nicolet Real Estate and Investment Corporation offered the Historical Society a plot of land on William Street next to the Fox River Trail. In August 2004, the little building was moved in the early morning hours to its new location at 201 William Street. Today the structure, complete with the original gas pumps, is maintained by the De Pere Historical Society and maintains it original purpose as a place of rest and relaxation only instead of for polo fans, for all citizens of our community and all users of the historic Fox River Trail to sit on a bench for a few minutes, take a breath, and rest.